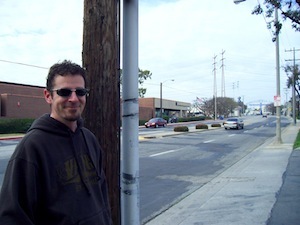 Zak Claxton is one of many Second Life musicians who have built up a loyal following. Over the past year I’ve been aware of Zak’s work on an album showcasing the body of original songs he’s built up. With the December 11th release of his self-titled album, I thought it was a good time to profile his work, to get his thoughts on the SL music scene and some tips of SL music performance. I do need to make a disclosure – I’ve known Zak’s real-world alter ego for seven years or so – we’ve hung out together throughout that time on a number of musician discussion forums. We both became Second Life residents around the same time and the Metaverse Journal’s Second Life presence was constructed by Zak’s partner Kat Claxton from Encore Design Group. Finally, I have had extensive involvement online with the other musicians on the album as well. Lowell: You’ve been a musician for decades – aside from the Second Life learning curve, was there any aspect of musicianship you’ve had to learn or change with Zak? Zak: Absolutely. Most musicians are used to receiving immediate feedback from their audiences, be it clapping, cheering, or throwing beer bottles at their foreheads. When I first started performing in SL, it was a bit disconcerting to finish a song and then wait for 15-40 seconds to have the audience react, due to the latency of the stream. You get used to it after awhile. Also, on a personal basis, most of my musical experience as a live performer previous to SL was as a member of bands. It took a short while for me to get used to being alone on stage, with no other sources of music than what I can perform in real time with my guitar and voice. But I got over that relatively quickly… it’s just a matter of experience. Lowell: Can you describe in a paragraph or two the process of making the album? Zak: I am extremely fortunate to have developed close friendships with a number of talented people in the music/recording business. When I decided to get serious and do a “real” album (as opposed to something I could record in my bedroom on marginal equipment), I enlisted the help of engineer/producer Phil O’Keefe, and recorded all of the tracks at his Sound Sanctuary Recording Studios in Riverside, CA. Then I called upon the talents of a couple of other multi-instrumentalist friends; Bunny Knutson provided drums on every song as well as some additional guitar parts, and Ken Lee also came in for a few songs on keyboards and guitars. The process was pretty simple. All of the songs were those I’d written to be able to perform as a solo artist, so it was just a matter of fleshing out the songs, arranging them for a rock band setting. We would go into Sound Sanctuary, and Bunny and I would perform the songs in real time, without any click tracks to lock us in. It was a very free and creative environment. After we got the drums down, we would layer other tracks via overdubbing. I played the majority of the guitars and bass, and did most of the lead and backing vocals as well. Phil O’Keefe also added various parts as needed. We started recording in March 2008 and didn’t finish until August 2009, but that’s only because our respective schedules didn’t allow us to record whenever we felt like it. We actually only spent six days in the studio during that time frame, and each of those days had us creating two complete songs. The sessions were actually very productive. Phil would then make rough mixes as we went along, and at the very end we had one final session to go through and make tweaks to those rough mixes. The whole thing was very smooth, and since I was working with great friends, we had an incredibly fun time at each session. Lowell: Can you divulge the inspirations behind any of your songs? Zak: I’m inspired by many things, both for the musical and lyrical content of my songs. First and foremost, I’m inspired by all the great music that’s been done before me. I’ve spent a lifetime as a lover of all kinds of music, and I did my best to allow those influences to be reflected in my songs. On a more specific basis, I find that nature is often a key source of inspiration. In a number of my songs, you’ll hear references to the sky, the sea, the sun, the stars and so on. I don’t know why; perhaps I feel these things are part of a bigger picture than the fleeting stuff that happens in our day to day lives. But I’m also inspired by relationships, and the interaction between people in general. Certainly, the fact that I’m madly in love with my ladyfriend Kat Claxton resulted in the creation of several songs on this album, specifically “This Afternoon” and “Always Tomorrow”. 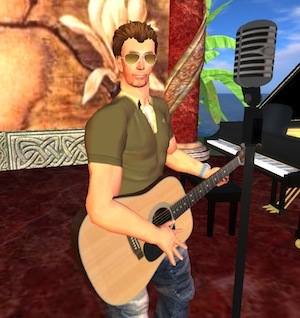 Lowell: Have you written any songs based on your performances in Second Life? Zak: I have, and have performed them upon occasion in SL. For example, I have a song called “Triana” that was inspired by a gal to whom Kat and I have become close in SL; she runs a weekly music trivia game we attend. However, it was important to me to make a distinction between what I do in SL and what I do on a more general basis as a musician. I did not want to make this an SL-centric album, and it was my intention all along to create music that people could relate to whether or not they’ve even heard of virtual environments. It’s safe to say that nothing that ended up on the album is specific toward SL, only because I wanted all people to be able to enjoy it with or without references to virtual worlds. Lowell: I know it’s hard to list a few, but are there particular SL musicians that you admire / have inspired or impressed you? Zak: Definitely, yeah. SL is simply a microcosm of real life, and much like the rest of reality, you have a small percentage of people who probably shouldn’t be playing music in public, and then a much larger percentage of people who are pretty decent and can play and have fun along with their audience. And beyond that, you have a small number of people who are obviously very talented. Again, these percentages line up with what you’d expect from any collection of musicians in any real life community. While most SL musicians do cover tunes in world, I have a greater admiration for those creating and performing original music. Some of my personal favorites include Grace McDunnough, a fellow singer-songwriter who is from Atlanta. I’ve also really enjoyed the live creations of a guy who would probably be considered a DJ, but is actually a great real-time remix artist named Doubledown Tandino. Slim Warrior is another original remix artist and singer who is very talented. She’s known in real life as SlimGirl Fat, and is currently achieving some well-deserved recognition in the UK. I also enjoy the music of a British guitar player and singer Blindboy Gumbo who does blues-based music. He’s great and does a fun show. Hexx Triskaidekaphobia puts on reggae/jam shows in SL as a pseudo-band called Born Again Pagans who are very original and cool. I also enjoy the performances of SL artists like Mimi Carpenter, Mel Cheeky, and several others. Lowell: What are Zak’s goals for the future? Zak: I tend to create music for the sake of the music, as opposed to ulterior motives like fame or fortune. I can say for sure that I still have a lot of music inside of me that has yet to emerge. I’ve begun writing songs for a second solo album, which I intend to start working on in early 2010. But on an immediate basis, my self-titled debut album is just coming out now, so I have some stuff to do to help promote it. In that regard, I will be doing some live shows in real life, and we’re making an effort to get terrestrial radio airplay here in the USA in addition to the Internet radio play we get on stations like IndieSpectrum Radio and SL Live Radio. While I’m not fooling myself into thinking my album will be some massive pop hit, I still want to do the things that will at least give it a chance to get heard, so the current focus is in that regard. I’m working closely with Kat on this stuff, since we’re partnering in a record label called Frothy Music to do the release of my album. And, of course, I intend on continuing to do live performances in SL on a regular basis. On average, I do about 5-6 shows each month, and I have no plans of slowing down. At the end of the day, I play in SL because I really enjoy it, and as long as there are people who want to see and hear me, I’ll be there. Lowell: Have you collaborated at all with other SL musicians and if not, is it likely to occur in the future? Zak: I have, but not in the way I’d really prefer. I’ve taken part in a couple of collaborative efforts that were designed to bring some attention to the SL music community as a whole, but in both cases, I just sang a few lines on someone else’s song and didn’t have much direct participation beyond that. However, I would definitely love to really collaborate on something new with a fellow SL musician. While I don’t have any firm plans at the moment, having focused on my own album in recent months, I can absolutely see that happening at some point soon. Lowell: You’ve put a lot of work into developing the Zak Claxton persona: do you see Zak as a creative psuedonym for Second Life only or is there a broader connection for you? Zak: My story is pretty funny in this regard. 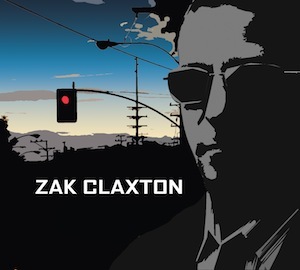 I became Zak Claxton pretty much by accident; it was a name that I picked while signing up for SL in 2006 without giving it much thought. I certainly didn’t plan on it being a name I’d use for purposes other than in SL. At that stage, I wasn’t even fully aware that one could perform music in SL at all. I started doing live shows in SL in early 2007, and I can now honestly say that around the world, many more people know the name Zak Claxton as a musician than they would associate music with my given name. If I already had some really great sounding, marketable name in real life, I might have been more open to using it for my musical endeavors. But unfortunately, I don’t; my real life last name is kind of long and German and clunky. So, Zak Claxton has become my official stage name. I find it likely that with or without SL, I probably would have chosen an alternative name which I’d use to release my music, just as Bob Dylan, Sting, and many other artists have done before me. It just so happened that Zak Claxton sounds cool, and I’ve already built a decent-sized following of fans who know me as Zak. It all worked out, despite not being part of a plan. I love when random things happen like that. Lowell: Does Zak have any plans to perform in other environments like OpenSim, Twinity or Blue Mars? Zak: I see no reason why not, though I have yet to delve into any virtual world beyond SL. To me, these are all platforms where new fans might be found. Live music is an appealing form of entertainment in just about any environment, and if OpenSim, Twinity and Blue Mars (or others) offer ways to attract an audience and do performances as easily as can be done in SL, I think it goes without saying that I’ll eventually be looking into them. Lowell: Ignoring the Second Life aspect, why should people buy your album? Zak: What I really want is for people to throw away all the other stuff when it comes time to judge my album worthy of purchase. Don’t think about SL. Don’t think of me as an avatar strumming a cartoon guitar on a virtual stage. And above all, don’t think, “He’s pretty good for an SL musician.” I want the music and the recording to be judged based on the same criteria you would any new music you’ve ever heard. If you hear something that connects with you, and you truly enjoy the music, then I hope you buy the album, or at least get on one of the online retailers like iTunes and purchase the song you like via digital download. I think there are aspects of the album that will have a strong appeal to people who appreciate music that lasts longer than the typical pop tune. My strongest musical influences — people like Neil Young, Joni Mitchell, Led Zeppelin, Pink Floyd, the Police, and so on — seemed to write music that stands the test of time, and doesn’t necessarily feel dated after a few years go by. I would like to think that my album possesses some of the qualities that put it in a similar vein. And while some folks may want to skip over the harder rock stuff and others won’t bother with the softer stuff, I think there’s something on the album for everyone who enjoys well-crafted songs. I hope so, anyway. Lowell: Have you managed to convince the other musicians on the album to join you in SL? If not, why not? Zak: Well, I can say that they’ve certainly heard me babbling on for three straight years about how I view SL as a musician’s paradise. But what I usually get in return are excuses like, “That seems cool, but I don’t have time for it,” or, “I’m not sure my computer can handle the graphics,” and so on. In fairness to them, not all of my real life collaborators are the type of musicians who are comfortable doing solo performances, as most SL shows are done. Out of the three folks who helped me on my record, only Bunny has even tried out SL, and sparingly at that. On a side note, I would enjoy the hell out of doing a full band show in SL. I mean, there are logistical challenges, but it’s been done both as real-time live performances with the band members in the same room, and as relay-streamed performances where each musician is in a different place. But it can be done. Like most things in life, it’s more a matter of people with busy schedules and jobs and families to take care of, rather than a lack of desire to do it. I think it’ll happen eventually. Lowell: Is it true the drummer on your album spent many hours camping in SL casino chairs before the gambling ban came in? Zak: Let me tell you something about my drummer: I love Bunny as much as any man can love another without deviating from his heterosexuality. His contribution to the overall feel of the album cannot be understated. He was right there for every moment of the recording sessions, and added invaluable opinions to the process of capturing the songs. The mere fact that he was probably better known as a punk rock guitar player before tackling drums on this album says a lot. He stepped up to the occasion, and while he’ll tell you with typical modesty that his performances were subpar, I tend to think that he was the best drummer on the entire planet for my music. And yes, I think he did enjoy some camping chairs during his brief tenure in SL. It’s certainly true to his form. Lowell: What advice would you have for musicians wanting to create music in Second Life – what mistakes should they avoid? Zak: Lots and lots of mistakes to avoid. First and foremost, check your ego at the door, as Quincy Jones once famously said. I’ve seen a number of musicians come into SL thinking they should be the hot ticket from day one, since they have a bit of real life experience as a musician. But as I mentioned earlier, there’s actually a pretty deep talent pool in SL, and like any music scene you’re trying to break into, you have some dues to pay in terms of getting recognized. Second, it’s pretty silly for musicians to think of SL as a viable income source in and of itself. Granted, there are folks who’ve worked their asses off to develop a large fan following, and perform several times per day every single day, and make relatively great tips at each show. I can see some of those folks making enough money to pay their rent, perhaps. But in the entirety of the SL music scene, which probably comprises over 500 people who perform on a regular basis, there are maybe three to five folks who fit this description. It’s a tiny percentage. Third, while you shouldn’t set the expectations too high from the income available in SL itself, don’t get discouraged and quit. In my opinion, the real value of SL to musicians is exposure beyond your wildest dreams. Look, I live in Los Angeles, right? One of the world’s musical Meccas. And yet, there’s no possible way I would have had as many people listen to my original music as I have with SL. That’s not even mentioning the fact that I have fans who enjoy my music and are based in Australia, Canada, all over Europe, across the USA, and so on. The opportunity for getting your music out there is tremendous. Here’s a simple thing that still needs to be said: if you’re at all serious about using SL to perform at a level expected for a professional musician, don’t try and sing and play through your computer’s built-in mic using Voice. You should treat it like you would any real show, meaning you use gear that’s appropriate for showing off your skills, and you use an audio stream that will give reasonable quality to your sound. Anyone can hear the difference when musicians are using decent mics, instruments, computer audio interfaces and so on. Finally, keep in mind that despite the preponderance of people like me who strum acoustic guitars and sing in SL, there should be no limitations in terms of the type of music you play. I’d actually like to see more hip hop artists, more ambient and experimental music, more classical music, and more jazz in SL. In fact, there are probably entire audiences of SL residents who are just waiting for more varied types of musical performances. No matter what type of music you do or how you perform it, give SL a shot and see what happens. Lowell: Aside from musicians in SL, which SL residents have inspired you the most? Zak: I’m certainly amazed by the talented builders and scripters in SL. Some of what they do is awe-inspiring. A blog run by resident Bettina Tizzy called “Not Possible in Real Life” (http://npirl.blogspot.com/) sadly just decided to close, but the content there is fantastic, showcasing the art, architecture, and other creative aspects of SL. I would also say that some of the SL-centric social commentators like Crap Mariner have been enjoyable to get to know. Also, the few people who have successfully established business models that work in SL are inspirational from the standpoint of virtual worlds’ continuing acceptance into the mainstream. All that having been said, my biggest inspiration in SL does indeed come from the community directly involved in the music world, which includes the artists, the people who own and run venues, and the fans. It’s been a positive inspiration since day one, and even if I’d never used SL as a platform for my own music, it would have been highly worthwhile based on the friendships I’ve made through the SL music scene.